In the days to come the frail black rebuses of blood in those sands would crack and break and drift away so that in the circuit of few suns all trace of destruction of these people would be erased. The desert wind would salt their ruins and there would be nothing, nor ghost nor scribe, to tell to any pilgrim in his passing how it was that people had lived in this place and in this place died. 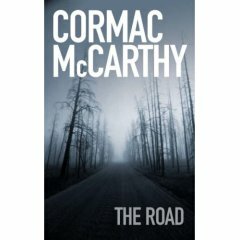 A recent house guest of ours made the remark that they’d put off reading Cormac McCarthy’s The Road because they thought it would be too depressing. I commented that if they found this novel bleak then they should certainly avoid McCarthy’s Blood Meridian. Although I made the observation in jest there is a ring of truth to it; Blood Meridian is similar to The Road in how it reveals human behaviour in times of great hardship, but unlike McCarthy’s more recent novel it delivers little hope to the reader. Blood Meridian takes place in the American west of the 1840s, but it is unlike any other recent fiction set in this period. It does not attempt to redress the balance upended by film and print that previously cast the settlers as heroic and the Indians as villains. In many ways the native Americans are depicted as more brutal and inhuman than ever before. This novel attempts no revisionism because its dialogue is caught in its times, gaining its incredible strength because its voice speaks directly, like an echoing ghost, from that earlier period. There is no benefit of hindsight. Its characters and its readers are caught in the maelstrom of events; there are no heroes or villains and few, if any, of McCarthy’s cast deserve sympathy. I’d not go behind scripture but it may be that there has been sinners so notorious evil that the fires coughed em up again and I could well see in the long ago how it was little devils with their pitchforks had traversed that fiery vomit for to salvage back those souls that had by misadventure been spewed up from their damnation onto the outer shelves of the world. Aye. It’s a notion, no more. But someplace in the scheme of things this world must touch the other. And something put them little hooflet markings in the lava flow for I seen them there myself. The novel follows a young man, known simply as “the kid”, who is drafted into the army but escapes with his life following a massacre by Apaches. He meets and travels with the Glanton Gang, who include a maniacal, murderous and fearsome character known only as “The Judge”. They embark on a scalphunting crusade which descends into a murderous rampage, becoming more brutal than any Indian tribe (and brutality crosses all time – a quote included in the preface notes that the remains of a scalped victim have been dated at 300,000 years). The Glantons encounter the already dead and dying around them; in one scene they find a snake-bitten horse that resembles something disturbingly demonic. Nearby, a man has been shot and lies bleeding to death, singing hymns interspersed with insults to God. The travellers abandon him but they move away slowly, almost hypnotised by the haunting voice. McCarthy uses the Glanton Gang, who really did live and breathe in the 1840s, for the basis of his fiction, and Judge Holden may or may not have really existed as well, depending on which accounts you choose to believe. He is cast here as demonic and inhuman, both in his actions and his appearance. All-knowing (he teaches his companions to make gunpowder and appears knowledgeable about many subjects), unrepentant (a possible child killer), a bald, seven foot tall albino – I hoped for history’s sake he never did exist and will remain only a horror of literature. For me, Holden held at least one key to the novel – as the opening quote observes, traces of the past will fade and ebb away. The Judge states that the Earth is an anomily in the universe, the only inhabited planet. He collects sketches in his own private diary, but when copying ancient cave paintings he erases the originals. Holden appears to believe that he can selfishly become all knowing and consequently all powerful. The novel puts this delusion in doubt, although ends on a curious note with him still with the upper hand over those who dare to question him. Why then read Blood Meridian? Like all of McCarthy’s fiction it is very poetic. It is also a novel that works from the sum of its parts. By this I mean that a series of unconnected passages help to build a very strong narrative, one that works its way under the skin. Written in 1985, it is a fascinating precursor to The Road. Thematically very similar, although the later novel is far starker and briefer in content. 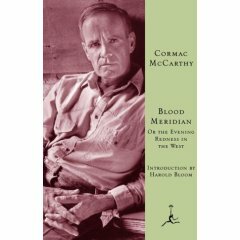 Blood Meridian casts man, often depicted as naked, at the mercy of the world’s elements and of his own nature. At times I think we need to address difficult fiction. This is a book that I will have to reread to fully appreciate and understand. But it’s certainly one to share, and for that reason I would recommend it to everyone. But please brace yourselves. All my life I had the feelin that trouble was close at hand. Not that I was about to get into it. Just that it was always there. All The Pretty Horses is the first part of Cormac McCarthy’s Border Trilogy. After recently reading The Road and No Country For Old Men I found it a much quieter piece and harder to get in to; there’s no fantastic hook to seize you (a post apocalyptic world or a dangerous psychopath) – All The Pretty Horses takes time with character and setting but is no less satisfying a read. What is apparent from the very beginning of this novel is McCarthy’s distinctive style of writing. He’s methodical and deliberate, describing in great detail his characters seemingly trivial movements; two young men ordering their breakfast in a diner, the setting up of a camp at nightfall or morning ablutions. Some of this detail at first appears unnecessary, but what McCarthy does is establish tremendous atmosphere and his descriptions of everyday tedium act as building blocks for the bigger picture. Imagine a huge canvas with a painting of an enormous landscape; McCarthy paints every blade of grass for you, every leaf, every figure on the horizon. Before you know it, you are immersed in the story and characters. All The Pretty Horses is a compelling and at times disturbing read. I won’t give away spoilers, but the passage where one of the characters meets his untimely end is simply brilliant writing: concise and moving, and I found the prison scenes some of the most gripping literature I’ve read in years. 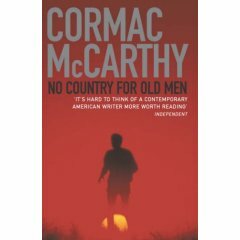 What does let the novel down, and No Country For Old Men effected me in the same way, was that McCarthy reaches such heights of intensity and tension that it is impossible to sustain them. I found that I’d stopped holding my breath way before the end, and the novel gradually ground to a slow and thoughtful halt. Torbett studied the country out there. The shadows long on the road. Who the hell are these people? he said. I dont know. I used to say they were the same ones we’ve always had to deal with. Same ones my grandaddy had to deal with. Back then they was rustlin cattle. Now they’re runnin dope. But I dont know as that’s true no more. I’m like you. I aint sure we’ve seen these people before. Their kind. I dont know what to do about em even. If you killed em all they’d have to build a annex on to hell. For anyone who has recently finished The Road and are looking for another Cormac McCarthy fix I highly recommend No Country For Old Men. This is another helping of McCarthy’s distinctive and highly original prose that immediately grips from the start. There’s also a high quota of bloodshed, some disturbing themes running throughout and one of the most effective literary villains I’ve encountered in a long time. Similar to The Road, No Country For Old Men works wonders with an ostensibly simple story. A Vietnam veteran (the setting is 1980) stumbles across the aftermath of a drug deal that has gone horribly wrong. He finds a suitcase full of money and decides to take it, a decision that immediately causes him a lot of anguish. After stealing the drug money Llewellyn Moss is pursued by the ruthless killer Anton Chigurh. Also thrown into the heady mix is the laid back and contemplative sheriff Ed Tom Bell. Although a fast moving thriller – at times Chigurh’s determined and tireless pursuit of Moss makes him seem like a distant cousin of The Terminator – this is also a deep and thoughtful piece. McCarthy takes his sleepy Texan setting and slams the modern and ugly world of drug running in its face. No Country For Old Men is also a novel that trips you up just when you think it’s possible to become comfortable following Moss’s life as a fugitive. McCarthy turns the whole thing on its head with a shocking turn of events – and then he does it again with stomach churning effect. I couldn’t wait to finish whatever else I was doing and get back to this book; it raises the stakes on what can be justifiably be classed as a page turner. No Country For Old Men has recently been filmed by Joel and Ethan Coen and I’ve already heard good things about it. In fact, if it’s anything as good as the novel I’m expecting a masterpiece. I do wonder though how they have turned this into a piece of cinema; whilst the novel at times reads like a screenplay – and McCarthy writes smart, witty dialogue that outstrips anything the Coen brothers have ever written – some may judge the outcome anticlimactic. No Country For Old Men becomes a quiet and resigned rumination on unbeatable and sickening evil and I admire McCarthy all the more for it. He’s brave enough to avoid the happy and neat ending – something that doesn’t belong in this young man’s world. He walked out in the gray light and stood and he saw for a brief moment the absolute truth of the world. The cold relentless circling of the intestate earth. Darkness implacable. The blind dogs of the sun in their running. The crushing black vacuum of the universe. And somewhere two hunted animals trembling like groundfoxes in their cover. Borrowed time and borrowed world and borrowed eyes with which to sorrow it. Don’t give up on The Road. It’s a bleak, depressing and harrowing book, but it’s still a remarkable work of fiction that deserves the praise it’s received so far, and deserves to be read to the end. Cormac McCarthy’s novel is set in a post apocalyptic world where the human race is facing extinction. Cities are burnt and abandoned, a sooty ash covers the cold and dying landscape, food and resources are scarce. Amongst this devestation an unnamed man and his young son struggle on, following an endless road in a vague hope that they will find safety, life and the fabled “good guys”. They search and scavenge; for food, tools and shelter and the story falls into a repetitive rhythm as McCarthy describes their endless tasks – filling their cart of belongings, gathering wood for fires, seeking out new hiding places, looking always for useful things. One of the most effective parts of the book is when the man finds a rare object of beauty, an antique sextant from an abandoned ship. After admiring it he simply discards it, an object useless to him in a life only in need of useful things. The Road isn’t a science fiction novel. We don’t find out what has happened to cause this catastrophe; it’s likely that there’s been a nuclear holocaust – but the conceit of this novel is that we must just accept what has happened. It isn’t a horror novel either, although it contains some of the most horrible scenes I’ve read for a long time. If I had to categorise this book I’d probably fail. It isn’t attempting prophecy; at the most it’s a warning of how easily humanity can slide into terrible depths, those of self-destruction, murder and cannibalism. What makes this novel work is the father and son relationship. As a parent I found this convincing and very moving; I couldn’t stop whispering to myself “yes, yes, yes” as I read on. Their relationship is just spot on – the father’s protection of his son at all costs, the boy’s endless questioning and need for reassurance, his scepticism and how they deal with the ever present danger engulfing them. The Road asks uncomfortable questions of the reader. How far would you go to protect someone? Would you be prepared to kill or be killed? Because the bond between father and son was so believable I found myself able to consider such questions. Unhappy reading at times, at others almost unbearable, but I was compelled to read on. I’m not giving away any spoilers here, but if you leave the book unfinished it will be a far bleaker experience for you than if you finish it. Don’t give up on The Road.